Definition of Prayer Stick: What is Prayer Stick? A Prayer Stick is also known as a Spirit Stick or Medicine Stick is used to make offerings and petitions to the spirit world. A Prayer Stick is primarily used by a Shaman or Medicine Man, but are also used and created by tribal members. A Prayer stick was buried in the ground which had a sacred meaning or significance and including springs, caves and near fields where corn is planted. Prayer Sticks are most often associated with rituals relating to religious ceremonies particularly of the Southwest Native American tribes of the Hopi, Pueblo and Zuni. Prayer sticks are called 'Pahos' by these tribes. A prayer stick can vary in shape but usually long and narrow, brightly colored and decorated with feathers that are selected according to the nature of the petition, and the person praying. Prayer Sticks, Spirit Sticks or Medicine Sticks are most commonly made from cedar, willow and cottonwood and decorated with paint, carvings and occasionally wrapped in buckskin or other leather materials. The size of the sticks are generally taken from the measurement between the elbow to the tips of the fingers. The pictures on this page show Native Americans holding prayer sticks. The various names given to these sacred sticks reflect their use in religious ceremonies and rituals. They are all used to make offerings and petitions to the spirit world. The stick is decorated with colorful signs and symbols and represent or reflect the prayer or message. A feather is often attached to prayer stick to call to the spirit bird or totem to carry the prayer, supplication or message to the heavens. The Spirit or Prayer Stick are used for the rites observed that relate to calling forth spirits in the evocation of a prayer, Prayer sticks are featured in funeral rites and observances, healing or cleansing prayers and blessings. They often are reserved for prayers needing the most powerful spirits, such as healing or cleansing prayers. Prayer Sticks were also used by the tribes of the Great Plains in hunting rituals and ceremonies and were created to call upon powerful spirits to protect warriors during battle. A different form of ritual and ceremony related to Talking Sticks. Talking Sticks were passed among members of a tribal council, and only the member holding the stick was free to express himself. 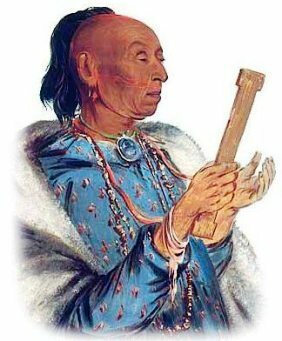 A prayer stick was seen as a powerful supplication to the spirits and the making and offering of a prayer stick was not confined to the Shaman or Medicine Man. At the time of the solstice, prayer sticks are planted by all members of a family in small holes that were dug by the head of the household. Each prayer stick is prepared with due respect and ceremony. The wood is carefully chosen for its strength and spirituality and taken from a tree that had special meaning to the person - refer to Tree Symbols. Permission was sought from the tree spirit to make the prayer stick. The bark was stripped and the prayer stick carved, decorated and a feather was attached. An offering of tobacco was occasionally tied to the prayer stick. The planting of the prayer stick was ceremoniously observed by the family and members of the community and silent prayers for rain and a successful harvest were offered during the process. Prayer sticks were important to religious ceremonies and rituals performed during the winter solstice which included the making and planting of a prayer stick. Seasons are marked by the turning of the sun on the solstices. Winter Solstice on December 21 marks the start of winter, it is the shortest day of the year in the Northern Hemisphere. After the Winter Solstice, each day becomes longer until the longest day of the year arrives around June 21. The Zuni and Hopi tribes celebrated the Great Feast of the Winter Solstice, called the Soyal. The main purpose of the Soyal ceremony and ritual is to bring the sun back from its long winter slumber. In preparation for the Soyal ceremony the Pahos, or prayer sticks, are made to bless all the people, their homes, animals and plants. The sacred Prayer sticks, pahos, were made in the Kivas as vehicles for the delivery of prayers to the Kachina. Prayer sticks were also used at the Niman ceremonies that were held at the time of the Summer Solstice during which the Snake Dance was performed. During the Moki Snake Dance the snakes represented living prayer sticks and featured in the dances of Kachinas to release and to carry prayers to the spirits. Spirit Stick. Discover the vast selection of pictures which relate to the History and Culture of Native Americans. The pictures show the clothing, War Paint, weapons and decorations of various Native Indian tribes that can be used as a really useful educational history resource for kids and children of all ages. We have included pictures and videos to accompany the main topic of this section - the Spirit or Prayer Stick. The videos enable fast access to the images, paintings and pictures together with information and many historical facts. All of the articles and pages can be accessed via the Native Indian Tribes Index - a great educational resource for kids.